While strolling down the main boulevard in Shigatse, the home of the Panchen Lamas, in 1987, I see only a few people and almost no cars. Tibet has just opened up for foreign travellers and back-packers some months before. Standing on the pavement, perusing the items displayed on makeshift tables in the market stalls, my eyes had suddenly fallen on a tiny text. The print is on handmade-parchment, fashioned in the age-old style of inked woodcarving. It is a revelation from many hundred years back, and its Tibetan title means Refined Essence of Oral Instructions. 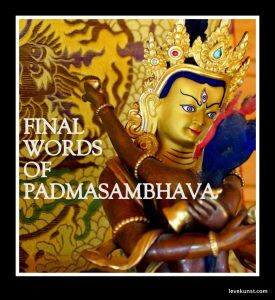 It contains the parting words of Padmasambhava as he is just about to leave Tibet, the master who is admired and loved throughout the Himalayan countries and now all over the world as being the main teacher of Vajrayana Buddhism. My breath stops and my heart skips a beat. The words are like hearing him speak to you in person. I buy two copies without hesitation. Great master! You are leaving to tame the rakshas. I am left behind here in Tibet. Although I have served you for a long time, master, this old woman has no confidence about the time of death. 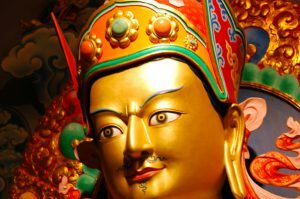 So I beseech you to kindly give me an instruction condensing all teachings into one, which is concise and easy to practice. 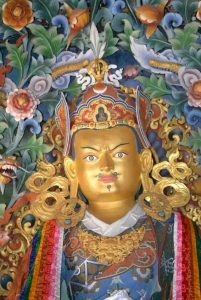 This text by the treasure revealer Dorje Lingpa was translated in accordance with the precious oral instructions of Tulku Urgyen Rinpoche and his Dharma heir Chokyi Nyima Rinpoche, by Erik Pema Kunsang and is included in Dakini Teachings, Rangjung Yeshe Publication. First published in LEVEKUNST art of life with the kind permission of the author.